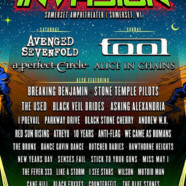 Northern Invasion General Admission and VIP tickets (including layaway options), as well as Hotel Packages and All-Inclusive Camping options, and Tent or RV Camping add-ons are on sale now at http://northerninvasion.com/tickets.html. Fans are encouraged to buy early and save. New forNorthern Invasion 2018: Each ticket price level has a limited number of tickets available, so attendees can save more by buying earlier. Ticket prices will automatically move to the next price level once a price allotment sells out. The layaway purchase option also allows fans to split the ticket cost into four monthly payments. The Northern Invasion campgrounds will be open from Friday, May 11 through Monday, May 14. Festival doors open at 11:00 AM on Saturday andSunday.